Detail of the Surveyor's Soil Mechanics/Surface Sampler, or scoop arm, an experiment flown on the Surveyor III and Surveyor VII missions. The SM/SS was used to dig into the lunar surface, providing information about the properties of the soil. 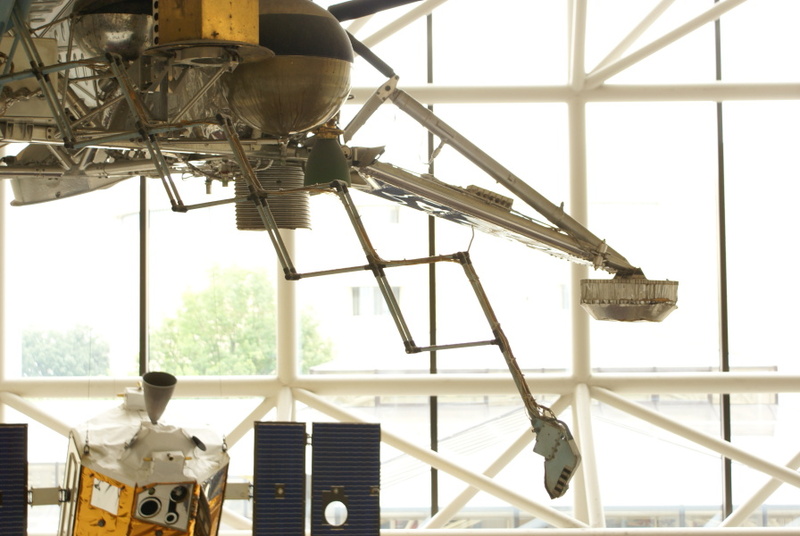 The Apollo 12 astronauts returned Surveyor III's scoop so that scientists could study the effects of exposure to the vacuum, radiation, and micrometeor bombardment of space. The returned scoop is displayed at the Kansas Cosmosphere. Note the high-pressure helium tank (the sphere with the black band), used to pressurize the vernier engine propellant system. Also note the green TD-339 vernier engine near the landing leg hinge point.